The third iteration of Russia’s MC-21-300 test aircraft completed its maiden flight on March 16, performing for a duration of 1:30 hours, reaching an altitude of 3,500 metres and achieving a speed of up to 450 km/h. 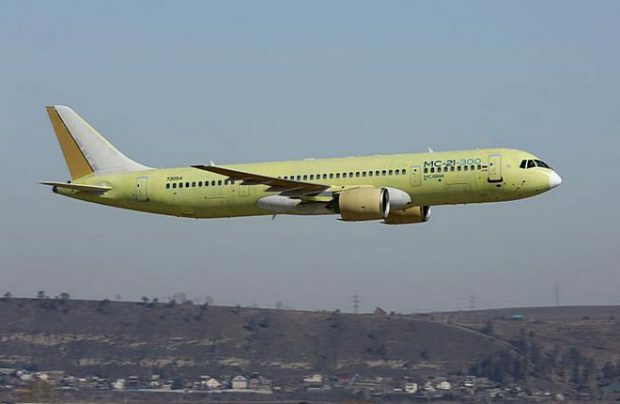 The aircraft – designated MSN73054 – is the first to be fitted out with a passenger cabin and will be debuted publicly at Moscow’s MAKS-2019 air show in August. Russian certification of the basic version of the MC-21-300 powered by Pratt & Whitney PW1400G GTF engines is expected in 2020. Deliveries should start in 2021. UAC has now logged 185 firm orders for the MC-21, mainly from Russian state-owned leasing companies. Although the first operator of the type is expected to be the nation’s flag carrier Aeroflot, which has ordered 50 units, it recently became known that the Russian government has advised state-controlled Aeroflot’s low-cost subsidiary Pobeda Airlines to consider replacing its 30-aircraft B737MAX potential order with the MC-21 instead. The MC-21 is set to compete with the Airbus A320neo and Boeing 737MAX aircraft types, as well as the COMAC C919, a new jet aircraft currently being developed by China. But the biggest challenge for the Russian advanced narrow-body project, which is now several years behind its initial schedule, is not the delay itself (which is understandable given the complexities of creating an entirely new modern airliner), but the uncertainties connected with the international political environment. In a recent development, the Russian government urged UAC to come up with a proposition to replace as many foreign-made components as possible with locally-made aircraft parts, after US sanctions interfered with the deliveries of materials for the MC-21’s composite wing, which prevented the USA’s Hexcel and Japan’s Toray from supplying composite materials for the MC-21. So far, the aircraft’s baseline engine, the PW1400G, is unaffected. “We are not rejecting the partnership with Pratt & Whitney. We won’t take any steps to upset that partnership,” Yury Borisov assures. According to Denis Manturov, Russia’s minister of industry and trade, it has been decided to hold the premiere public debut of the MC-21-300 aircraft with a passenger interior at Moscow’s international aviation and space salon MAKS-2019 exhibition in August.